Yes, the Quad has a new name. Cube. Four corners to each face. As in four fins. Get it? Okay. Not funny enough. Well we're not going to waste this precious space by telling you jokes anyway. So how about you stop flipping fancy pictures already and just get out and go sailing like you mean it. That?s all this board is about anyway. The Cube is Levi's go to board for side to side onshore conditions. A little shorter than the Sphere with more hips in the outline for turning and a fast rocker for early planing. Levi uses this model from Hookipa to Waddell Creek to Pistol River to Baja California and everywhere else. The Cube has a vee with double concave bottom for early planing. Its soft and stable ride allows you to go into turns at high speeds and still feel comfortable and in control. It?s the perfect board for those conditions that are a little out of control and you really want to tame that storm. 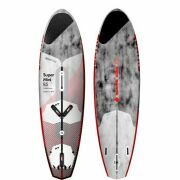 This board comes as a thruster and is the result of two years of research, development and feedback by Levi Siver, Camille Juban and Keith Teboul. We are very pleased to bring you this new user friendly, quick planing and versatile board with quite a magical fin placement.